The latest version of Ti.Utterance adds Android support for both Text to Speech and Speech to Text. The Ti.Utterance native module surfaces the native platform APIs for Text to Speech, and on Android now Speech to Text. The Speech proxy provides your Titanium apps Text to Speech capabilities on both iOS and Android. Ti.Utterance uses AVSpeechUtterance on iOS and android.speech.tts.TextToSpeech on Android. This enables you to provide the Ti.Utterance module with a string, such as “hello world” for the module to speak. The SpeechToText proxy is available on Android and provides Speech to Text capabilities using your device’s native platform speech recognizer. When the startSpeechToText method is called, a microphone dialog will appear and listen for input from the user. When the user stops speaking, Android’s speech recognizer will convert what was said into one or more text phrases. If Android is not fully able to match was is said, the speech recognizer will provide a list of options in the order it feels is the best match. + " matches found: "
One of the most popular effects in mobile today is the “blur”. Although the blur effect is most commonly associated with iOS, several notable apps such as Etsy’s Android app use this technique. The Ti.Blur module now provides Android support so that you can use this popular effect in both your Android and iOS Titanium apps. The initial release of Ti.Blur for Android provides two APIs make applying a Box Blur easy. The first APIs is an extended Ti.UI.View object called, BasicBlurView. This view works similar to a Ti.UI.ImageView and applies the blur effect to the image or screenshot provide. The second API is a called applyBlurTo and allows you to directly apply the Box Blur effect to an image. The following shows them module’s example app in action. The basicBlurView is a new view object within the Ti.Blur module. This view object applies a Box Blur to any image provided to it’s image property. The blurRadius property is used to determine the level of blur that is applied. This view would typically be used to blur an image, such as background image that you already have available in your app, or by taking a capture of the device’s current screen and providing it to the basicBlurView. The basicBlurView is also cross-platform providing support for both Android and iOS. The Ti.Blur module allows you to blur an image or blob directly without the use of a View object. This is helpful if you want to cache the image for later, or use one of Titanium’s other built in UI objects. The following code snippet is from the example app demonstrating how to apply a blur to an existing image packaged in your app. The Ti.mely project provides Titanium access to iOS and Android native timers. The native nature of these timers can be advantageous for background or long interval poling. Initialize the timer by calling the start method. This method takes the interval in milliseconds and an optional debug flag which will print timer information to your console window. To stop the timer, simply call the stop method as shown below. The Ti.mely source code and compiled modules are available on Github(https://github.com/benbahrenburg/ti.mely) under the MIT license. The below sample demonstrates how to use the Ti.mely module. This app.js is include within the module’s example folder or available for iOS here and Android here. value:1000, top:50, left:7, right:7, height:40, color:"#000"
The first release of Securely the Titanium security module is now available on Github. 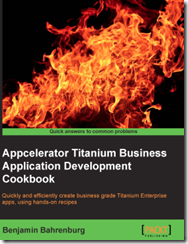 The goal of this project is to provide the tools and components needed to build secure Titanium apps. Securely provides a comprehensive set of methods designed to easily handle your most common security requirements. The source and compiled module are both available on Github under the Apache 2 license. Download the compiled Android or iOS module. The Square TimeSquare project provides a rich and unique full featured Calendar Picker. The cross-platform nature of this project makes it a perfect candidate for Titanium. I’m happy to announce, the Ti.SQ modules for iOS and Android which allows you to use this excellent component in your Titanium projects. The following provides all the details needed to get starting using this module in your projects today. All of the modules code, assets, documentation, and examples are available on github. Before you start – Please make sure you read the project readme file before starting. The readme file outlines all API differences and project dependences. Documentation – Project documentation can be found here. Examples – The iOS and Android APIs are almost. A majority of the examples should work cross-platform with only minor updates. Please make sure you read the documentation regarding the differences between iOS and Android. The examples can be found for iOS here and Android here. What to contribute– Pull Requests and other contributions are welcome. Examples, and documentation are also encouraged. The following snippet outlines a basic usage scenario for the Ti.SQ module. It is a common requirement to need to restart your app if the user restarts the device. Although this requirement is common, it can get tricky quickly. For example do you want to restart in the foreground or background? What if you want to send a notification instead? You can also use Titanium Properties to configure the above options from within your Titanium app. The BootReceiver is configured to work similar to how a native app would when it receives the BOOT_COMPLETED broadcast. Since Titanium might not yet be loaded, the module will help bootstrap your app based on the configuration elements in your tiapp.xml. Warning: This functionality requires you update your tiapp.xml file with a few specific elements. I’ve included samples for each scenario, but please plan on spending alittle time exploring in order to get the configurations for your app working properly. The below steps cover how to create the tiapp.xml entries needed for this module to work. Before installing the module, you will want to build your project for the simulator. It doesn’t matter if the app is empty or event runs. The goal is to simply have Titanium generate a AndroidManifest.xml file. You can find this file in your Project/build/android folder as illustrated below in red. To avoid the 2373 restart bug, you will need to add the following properties into your tiapp.xml file. 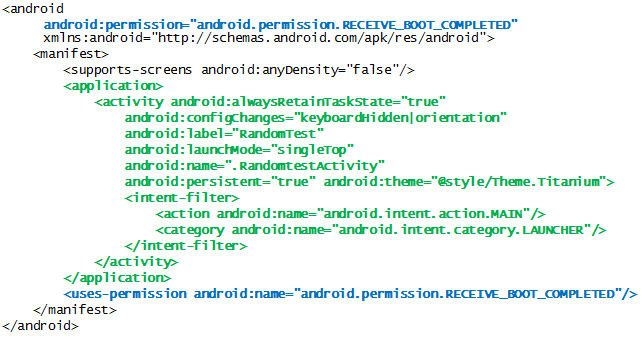 Using the information from step #1’s AndroidManifest.xml add an android configuration node to your tiapp.xml. (a) Add the two permission lines highlighted in Blue. (b) Add the application node from your AndroidManifest.xml collected in step #1. If you are copying and pasting the example, make sure you change the names to match your project information. The first scenario supported by the module is to restart your Titanium app upon receipt of the BOOT_COMPLETED broadcast. The following diagram demonstrates how to create a receiver entry in your tiapp.xml to use the BootReceiver module. The section shown in red illstrates the receiver and intent-filter entries needed to be made in order for your app to subscribe to the BOOT_COMPLETED broadcast. bootType : This meta-data element is required and tells the module which action to take. By using the restart option, the module will restart your application upon receipt of the BOOT_COMPLETED broadcast. sendToBack : This meta-data element is required if using the bootType of restart. If true, your app will be restarted in the background upon receipt of the BOOT_COMPLETED broadcast. If false, your app will be restarted in the foreground and the user will be presented with the first window of your app. Please see the sample tiapp.xml and app.js for the full example files. The second scenario supported by the module is publish a notification upon receipt of the BOOT_COMPLETED broadcast. The following diagram demonstrates how to create a receiver entry in your tiapp.xml to use the BootReceiver module. The section shown in red illustrates the receiver and intent-filter entries needed to be made in order for your app to subscribe to the BOOT_COMPLETED broadcast. bootType : This meta-data element is required and tells the module which action to take. By using the notify option, the module will publish a notification using the title and message properties defined in the tiapp.xml receipt of the BOOT_COMPLETED broadcast. title : This meta-data element is required if using the bootType of notify. The title is used to create the title for the notification that will be published after receipt of the BOOT_COMPLETED broadcast. message : This meta-data element is required if using the bootType of notify. The message is used to create the message body for the notification that will be published after receipt of the BOOT_COMPLETED broadcast. Allowing for the app at runtime to how to handle the BOOT_COMPLETED broadcast allows for handling more complex use cases but requires additional setup. Titanium Properties are mapped to configuration elements in your tiapp.xml. The value from these specific Titanium properties are then to determine the correct action to be taken upon receiving the BOOT_COMPLETED broadcast. bootType : This meta-data element is required and tells the module which action to take. By using the propertyBased option, the module will look at the following properties to determine which action to take. enabled_property_to_reference : This android:value element contains a reference to the Titanium Property the module will reference to see if this feature has been enabled. This property must contain a Boolean value and is false by default. bootType_property_to_reference : This android:value element contains a reference to the Titanium Property the module will reference to see what action to perform. Just like the primary bootType element, you can use restart or notify to perform the desired actions. Please note all configuration elements such as title, message, sendToBack will be read from the Titanium Properties mapped in your tiapp.xml file. sendToBack_property_to_reference : This android:value element contains a reference to the Titanium Property the module will reference to see if the app should be restarted in the foreground or background.. This property must contain a Boolean value and is true by default. Please note: This property is only used if the Titanium Property define in bootType_property_to_reference is set to restart. 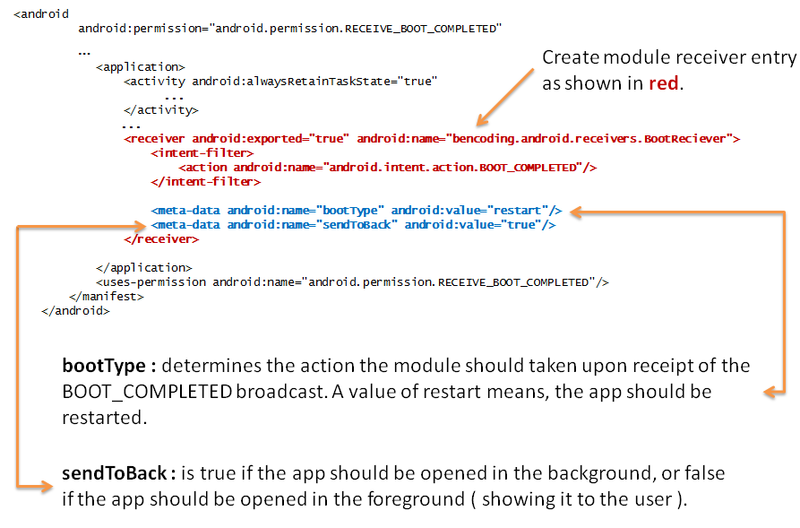 icon_property_to_reference : This android:value element contains a reference to the Titanium Property the module will reference to determine which Android Resource Id to use when creating the icon for the notification created on receipt of the BOOT_COMPLETED broadcast. Please note: This property is only used if the Titanium Property define in bootType_property_to_reference is set to notify. 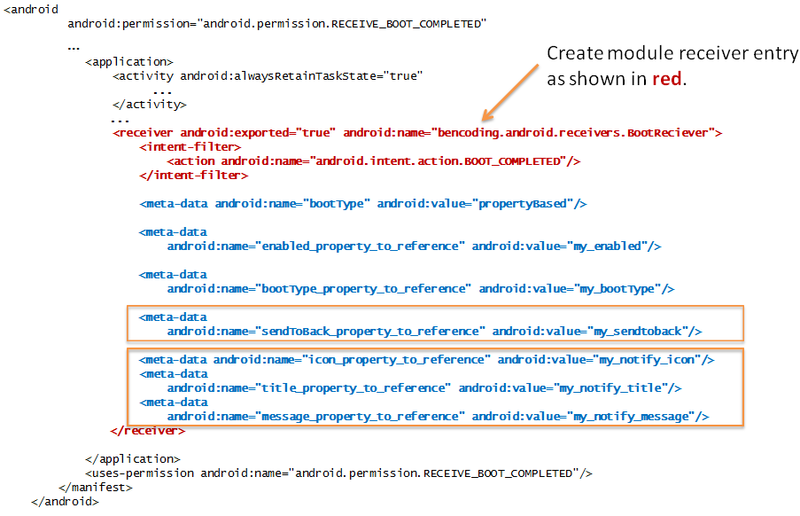 title_property_to_reference : This android:value element contains a reference to the Titanium Property the module will reference to determine which Android Resource Id to use when creating the title for the notification created on receipt of the BOOT_COMPLETED broadcast. Please note: This property is only used if the Titanium Property define in bootType_property_to_reference is set to notify. 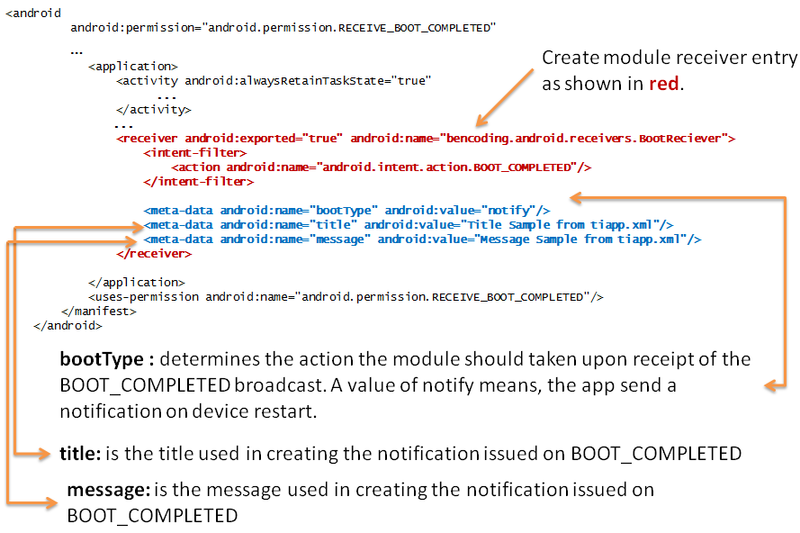 message_property_to_reference : This android:value element contains a reference to the Titanium Property the module will reference to determine which Android Resource Id to use when creating the message for the notification created on receipt of the BOOT_COMPLETED broadcast. Please note: This property is only used if the Titanium Property define in bootType_property_to_reference is set to notify.